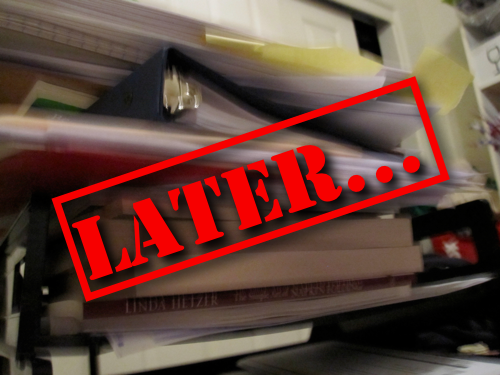 “I’ll do it later” is the enemy of time management and eliminates our control over our Time Diets. Why do we procrastinate? Here are the 5 most common reasons and what we can do to stop! The biggest reason people put something off is because they don’t want to do whatever it is they have to do. When we don’t want to do something we become really good at convincing ourselves that we’ll want to do it tomorrow instead. In fact, we come up with fabulous excuses such as, “I’ll feel more inspired tomorrow” or “Tomorrow, I’ll feel more well rested and it will be easier” or “This will be first on my list tomorrow.” However, when tomorrow finally gets here, we don’t feel any more like doing the task than we did the day before. Don’t let yourself fall for these excuses. We’ve all felt that intense stress and pressure when we’re working up against a deadline. The problem is, some people thrive on it. How do those of us who work best against a deadline fight procrastination? Make your own deadlines! If you make your own deadline a few days before the real one, you still get the feeling of working under pressure without being in danger of actually missing your deadline! Afraid you won’t stick to a self-created deadline? Tell as many people as possible about it to help hold you accountable. When someone asks us to do something, the first question we ask is, “When would you like it to be finished?” The second follow up question we often forget to ask ourselves is, “When am I going to start this?” Without a definite start date in mind, we run the risk of putting a task out of our minds until the due date is staring us in the face. Saying you’re going to do something is not the same as planning when you’re going to do it. Never write a due date in your calendar without also writing a start date. We’ll often procrastinate on creative tasks because we haven’t thought of the perfect idea yet. Here is the problem: You could spend a lifetime waiting for the perfect idea to pop into your head. Sometimes you need to just start writing. Your first idea doesn’t have to be perfect but at least it’s something! It’s easier to revise a mediocre idea than continue to stare at a blank page. If you’ve been a procrastinator your whole life, it can be extremely difficult to break yourself of this bad habit. I’ve even heard people justify their procrastination by saying, “I’ve always procrastinated and I’ve never been late with anything.” That’s like saying that you don’t need to buy car insurance because you’ve never been in a car accident. If you consistently wait until the last minute to do things, you will miss deadlines. It’s only a matter of time. Not to mention the fact that procrastinating triples your stress level when “crunch time” comes around and you’re more likely to have a productivity crash afterwards from sheer exhaustion. Stop making excuses and start doing things now. Did you enjoy today’s blog? Click Here to join The Time Diet mailing list and have weekly blog updates delivered straight to your inbox!